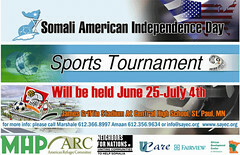 The 8th Annual Somali American Independence Day Tournament began this past weekend at St. Paul Central High School and will come to a close when a champion is crowned on July 4th. The tournament celebrates both the Independence Day of Somalia, which is July 1st, and the Independence Day of the United States, the Somali community’s new home. “We are not coming here to play the best players in the world or the best in the United States, we are coming here to play with people that have a common identity with us. We are Somalia, and we are American now,” says Guled Dalmar, 27, of Dallas, TX, in an interview by Andy Gerder in the Pioneer Press. The tournament not only unites Somali refugees from all over the country to share the sport they all love, but it also creates an open forum for the players and spectators to share their stories of hardship and triumph with their fellow countrymen. As Guled Dalmar mentions, a shared Somali American identity unites the participants. But as we discover through Minnesota Historical Society’s Becoming Minnesotan: Minnesota Immigrant Oral Histories Project, the topic of identity is difficult for all recent immigrants, including the Somali population. Throughout this series of wonderful interviews, the issues of cultural preservation and identity, assimilation into American culture, and the difficulties navigating the transition are especially difficult given the deep traditions within Somali culture. For example, Maryan Del, a participant in the oral histories project, discusses the importance of the Hijab, the traditional headscarf worn by devout Muslim women for the sake of modesty, and tells how women make a decision whether or not to wear it. Borealis Books Summer E-book Sale! Take Minnesota with You Wherever You Go! 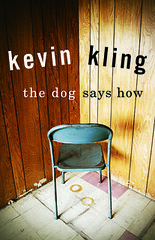 Ten Minnesota e-books by Minnesota writers for $4.99 each from popular e-book vendors including amazon.com, barnesandnoble.com, and Apple’s iTunes/iBooks store. We are excited to share these specially priced Borealis Books titles with our digital readers. Click here for the list of titles and details! The wait is over! After two long years, Ricky Rubio, the Minnesota Timberwolves’ fifth overall pick in the 2009 NBA draft, has finally arrived in the North Star State. He was greeted by 200+ fans and reporters ready to give him a warm ‘Minnesota Nice’ welcome. Upon being drafted in ‘09, Rubio decided to stay in Spain to play out the remainder of his contract, which did not allow for his release until 2011, and to take time to mature as a player on the court. Below is an exclusive one-on-one interview with Ricky Rubio. If you think two years is a long time, try roughly two decades! That’s how long the state had gone without a professional basketball team before the Timberwolves settled here. This story and more are collected in Minnesota Hoops: Basketball in the North Star State, written by Marc Hugunin and Stew Thornley. The state’s first professional basketball team was the Minneapolis Lakers, which began competing in 1947. Sadly, the team departed in 1960 to become the present-day Los Angeles Lakers. Though the American Basketball Association attempted to make a lasting impression with the Minnesota Muskies and Minnesota Pipers, each team stayed only a year before moving elsewhere, having played in front of mostly empty seats at the Metropolitan Sports Center in Bloomington. After much patient waiting, Minnesota finally got to field a professional basketball team again when on November 3, 1989, the Timberwolves played their first regular season game against the Supersonics of Seattle. After hearing that story, two years of waiting for Ricky Rubio does not seem so bad, now does it? To learn more about the rich history of basketball in Minnesota, be sure to check out Minnesota Hoops: Basketball in the North Star State. 48th Annual Tater Daze (June 16-19): Don’t Forget the Gravy! Barnesville Minnesota’s Potato Days, held August 26-27, has landed a spot on Reuters list of the Top 10 Wacky U.S. Summer Events. Potato Days, a two-day festival celebrating the starchy vegetable, involves a French Fry feed and, of course, Mashed Potato Wrestling, where participants duke it out in a vat of spuds. Check out this video for a taste of how wacky this event truly is. Luckily for us, we don’t have to wait until August to enjoy potato festivities here in the Twin Cities. Brooklyn Park hosts their 48th annual celebration of spuds, Tater Daze, this weekend at Noble Sports Park. Festivities kick off Thursday night with a parade starting at 6 o’clock and run all weekend long. According to the website, Tater Daze is a festival to honor the humble potato as well as to celebrate the resiliency and sense of community Brooklyn Park has held through tough historic times. Activities for this year’s Tater Daze include the parade, fireworks, and a carnival with rides and various attractions as well as soccer and softball tournaments, 5k walk/run, battle of the bands, BP’s Got Talent competition, and an art and vendor sale. New features include a cooking contest and, of course, mashed potato wrestling! 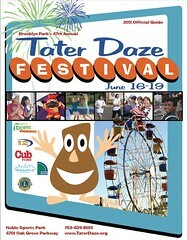 For more information regarding Tater Daze as well as a complete list of activities, check out their online Tater Daze Guide. For many Twin Cities school-age students, summer vacation has arrived! Sunny skies and beautiful weather are some of the many perks of the season. But now that school is out and kids are at home, what is a caregiver to do? Well not to worry, the MHS Press has answered the call and delivered a fun book with a refreshing digital twist. 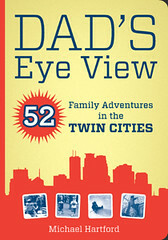 Dad’s Eye View: 52 Family Adventures in the Twin Cities by Michael Hartford compiles a wide assortnent of exciting activities for the entire family to enjoy right here in the Twin Cities. Minneapolis/St. Paul residents as well as visitors to the area will discover the most affordable, educational, and yes, fun things to do and see throughout the 52 weeks of the year. The book is a one-stop-shop for family fun in the Twin Cities and immediately connects users to locations, prices and descriptions of places that make Minneapolis and St. Paul great places in which to live and visit. Sample venues include the city libraries, museums such as the Walker Art Center, Minneapolis Institute of Arts, Science Museum of Minnesota, and lesser known gems such as the Twin Cities Model Railroad Museum and Pavek Museum of Broadcasting; celebrations such as Holidazzle and the May Day Parade; outdoor activities such as sledding at Minnehaha Creek and visits to regional parks. In addition to profiling each of the venues in the book, Hartford includes info about quick trips, restroom accommodations, and family discussion questions to truly engage kid’s minds, making these adventures both a learning and entertaining experience. We are also pleased to share the content of the book via our free mobile application, available on the iPhone, iPad, and iPod Touch! The Dad’s Eye View interactive application enables users to search and select activities by criteria such as season, price, or weather (indoor/outdoor) in order to find activities that meet the requirements of the day. Users can contact any location with the touch of a finger and get directions and find the location on a map. The social media interface allows users to rate and share their experiences at each venue by connecting to social media sites such as Facebook and Twitter. A coalition of organizations has launched a website for the documentary River Revival: Working Together to Save the Minnesota River, which will air on KARE 11 TV on Sunday, June 12, at 6:00 p.m. The hour-long film, narrated by Minnesota Bound’s Ron Schara, features a geological and cultural history of the Minnesota River and focuses on the many types of pollution affecting the river and its basin, paired with success stories of people working together to restore the river. The Minnesota River has been listed as one of the dirtiest in the nation. The Star Tribune recently ran a front-page photo showing the river dumping sediment into the Mississippi at Fort Snelling. A report released last month from the Minnesota Pollution Control Agency highlights how much sediment is being deposited in Lake Pepin, a 20-mile-long wide spot in the Mississippi River. Given the sheer amount of sediment, in a mere 300 years Lake Pepin could disappear. On Sunday, there are “Watershed-Wide Viewing Parties” at locations around the state where you can watch the film, meet fellow concerned citizens, and discuss community solutions.